For our September meeting we had the pleasure of welcoming Eddie Gorman as our demonstrator and Eddie with his wit and expertise gave us a very entertaining afternoon, showing us how to combine metal with wood to great effect. In this instance he used pewter to enhance turnings such as bowls, eggcups, and boxes. He started by explaining the properties of the metal which is an alloy of tin and copper and has a low melting point of around 270°. This makes it easy to work and to melt it he used a small shallow pan over an electric ring. He did tell us to avoid using pewter which contained lead especially if the piece were to hold or be in contact with food. He had with him a partly turned bowl in ash of about 150mm in diameter which he explained he was going to finish with a pewter rim and then proceeded to prepare a mould to cast the rim. 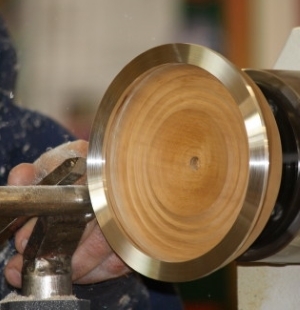 The mould which was cut from 18mm MDF was 25mm wider in diameter than the bowl and this he mounted on a faceplate on the lathe. The next step was to mark from centre, in pencil, the inner and outer rim of the bowl (which was about 10mm) and using a parting tool proceeded to cut a recess 8mm into the MDF. The mould was now ready for casting and this he removed from the lathe, still in the chuck and set it face up on a flat surface. The pewter was already melted and using an oven glove to hold the pan he poured the hot metal into the recess in the mould. This has to be done with great care and every precaution must be taken to ensure this is done safely. The pewter takes some time to cool so has to be put aside but in true Blue Peter fashion, Eddie had one which he had prepared earlier. This he put back on the lathe and using a 10mm parting tool he began to dress the set pewter, first cutting it to a smooth finish and then forming a small rebate to the inner rim giving the ring maximum hold when it comes to adhering it to the bowl. (I should point out that the metal will blunt the tools.) This done, Eddie, again using a parting tool, freed the ring from the mould and putting it aside remounted the bowl on the lathe ready for the fixing of the pewter rim. 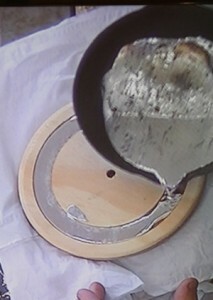 First forming the opposite rebate to the rim of the bowl the pewter ring was then fixed in place using medium superglue and when set was now ready for the finishing stages. 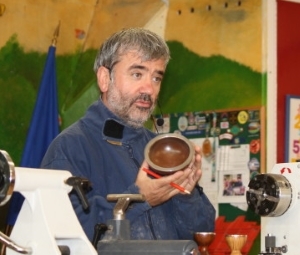 Eddie now shaped the bowl using a bowl gouge taking care to work in from the rim so as not to spall the outer edge of the metal but when sanding and polishing worked outwards as the dust from the pewter might stain the wood. Polishing the metal does take time as you have to go down through very fine grits and finishing with polishing compound but the result is well worth the effort as can be seen from the photos. Thank you Eddie, we all look forward to seeing you again in the future. Thanks to all for attending and thanks to Tom Wilson for the welcome refreshments at the break. Looking forward to the next meeting.